When I don't know what I want to drink, or what to serve friends, I default to a Negroni. A classic cocktail with three ingredients, this drink doesn't require a minor in mixology or complicated bar equipment (you don't even need a shaker) -- and yet it is a damn solid drink. Here's how to make one. When I don't know what I want to drink, or what to serve friends, I default to a Negroni. A classic cocktail with three ingredients, this drink doesn't require a minor in mixology or complicated bar equipment (you don't even need a shaker) -- and yet it is a damn solid drink. Classic cocktails stand the test of time and the Negroni has earned its rightful position as staple drink. If you like, you can make these with painstaking love, one glass at a time, with finite precision with your garnish, but there is no need to get too precious. The beauty of this drink is its steadfast simplicity: a 1 to 1 to 1 ratio of gin, sweet vermouth and Campari. If entertaining a group, you can cheat by making a batch (just don't add ice too far in advanced when making by the batch, it will melt and spoil your concoction). Negronis belong in the martini family in the true sense of the term: straight alcohol, not a splash of anything. They pack a punch and have a beautiful complexity about them. Not too sweet, not too bitter and a gorgeous colour. The rich red of Campari screams summer for me, la dolce vita in a glass. The drink was invented by a Count (really) who worked as a rodeo cowboy, if that's any indication of the drink's stock. Not a wimpy cocktail. 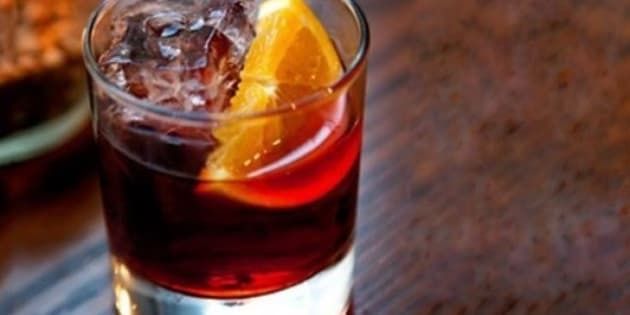 Here's how to put it all together -- the perfect Negroni, in one minute.